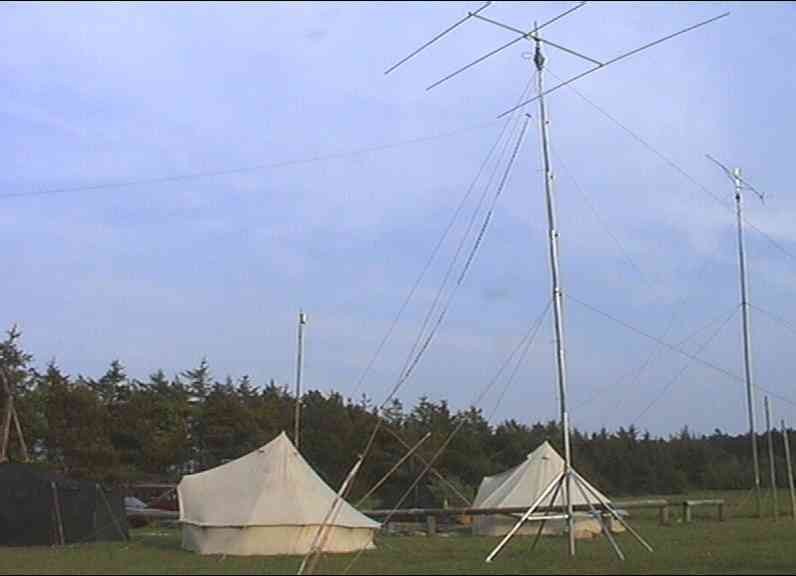 To OZ1RDP belongs an Aluminium tower, who can put yagis up to a height of 13m. Sometimes he also is in use for another fixing point of wire antennas. By missing a devise to mount the tower, the weight on top should be not to high. 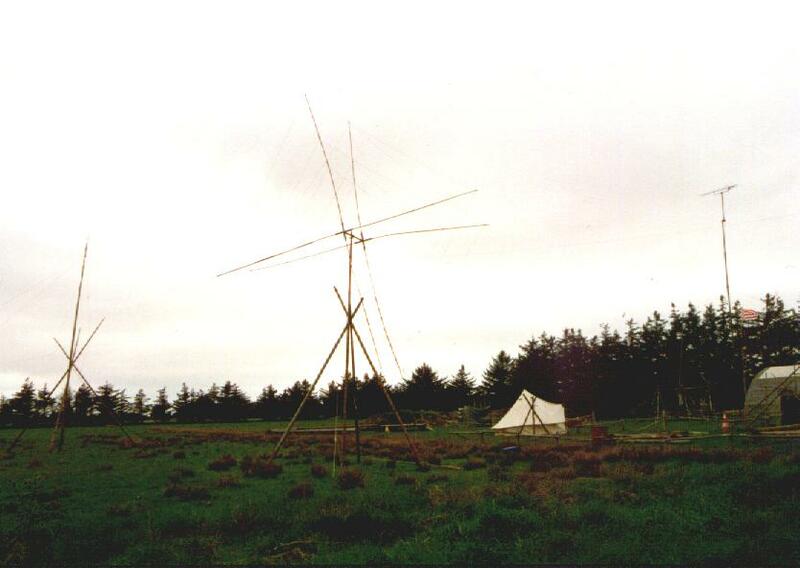 1997 a homemade 2-element-3-band Quad was build by bamboo-poles. We got no good results compared to the much work by building and mounting the antenna. Moreover: by closing the rear car door, the front windscreen were damaged by the in the car loaded, 4m long bamboo-poles (damned). In 1998 we looked for alternative forms to 80m-band antennas. 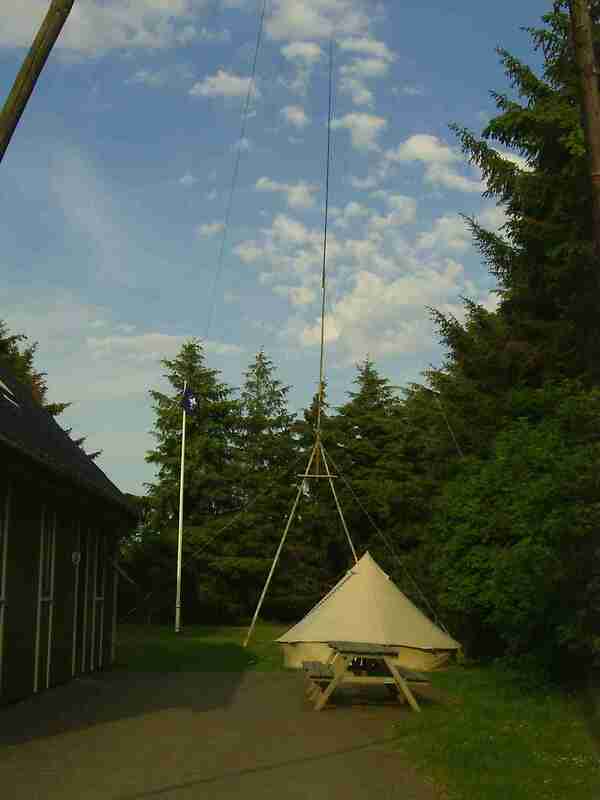 To the end we built a 17m high wodden tower, trademark "homemade", were we mounted a delta-loop for 80m. Later we took over again the idea of this kind of wodden tower (see 40m-GP). During the maximum of solar flux in 1999 we mounted an 3-element-mono band beam for the 10m-band by using an 10m high sliding tower. Good connections to Africa (Zimbabwe, South Africa) and exclusive 16 QSO to South America justified the work. See: Double zeppelin extra mounted on top of the tower; in the background 2m-yagi with 13m-tower. We had the possibility, to build up a logarithmic-periodic antenna (LPA). For mounting we used elements of the aluminium tower. The antenna was turned manual. By using an output power of 100W p.ex. 163 QSO statessides were possible. The last years we changed over to a 17 element long-yagi for the 2m-band, which is used with pre-amplifier and power-amplifier (up to 600W). DX-QSO to DL, SP, OK, G, LA, SM, ON und F are in the log. The odx (longest distance) is a contact to OH9O at may, 30th 2004, by bridging 1.252km (Loc: KP23BC). During winter-time Matze, DL9BQ, was constructing this 2-element-3-band wirebeam (moxon-beam) for the 10m-/15m-/20m-band. Mounted on top of a 10m-slide-tower, the antenna turns manual. A feeder-line is used. This antenna works in a preferable direction. Nice to see radiator and reflector for each band (10m, 15m, 20m) and the feeder-line. Right below the loop for the 17m-band. In 2008 Matze mounted a rotor on top of his Moxon-Beam, which ursually be used as motor to regulate a ventilaton flap valve and modificate it with a potentiometer to indicate the position. Now the rotor, type "armstrong", had become history! In 2003, 2004 and 2008 also a vertical for the 40m-band is in use. The basis is the construction of the wodden tower in 1998. But now on top a 10m long glass fibre tower (Spieth-Mast) is mounted. The antenna is a homemade "Triple-Leg" with a 10m long radiator and 3 radials (equal long), which are streched by an angle of 45°. Because of its height of 21m the antenna looks above all bystanders trees. The coax cable (RG-213) is in use without any baloon, directly connected to radiator and radials. By diposal use of 1.000W hf-output good contacts to ZL, VK, ZS, South America and whole Europe are possible. All connections of the tower construction are made by knots. There are two triple safety ropes to fix the tower: On top of the wodden "A" and in the middle of the glass fibre tower. This construction don't like any movements, because the elements of the glass fibre tower are not fixed, so he can reduce himself by stormy wind. Critical also is the connection between wood and the glass fibre tower (devided on two knots) - but up today nothing breaks! Result: A nice antenna for DX-ing with few installations. But about 4-5 workers are needed for mounting. In 2004 a 20m high glass fibre tower was the basis for a 80m-band vertical. By using an automatic tuner and radials on the floor this wire-antenna was mounted and used - as well on other bands. A comparison with the Moxon-Beam on the 20m-band and a radio-station in Colombia only showed a 6dB poor signal strength. In 2005 we used our Aluminium tower to mount a 2-element-Beam for 40m for the first time (HyGain). To put up and take down a car was needed, therefore only 4 pairs of hands were helping. The antenna was turned by "Armstrong", by handmode - a Rotor had been to heavy for the tower. Unfortunally the insert of effort don't gave the result we wished. In 2006 we extend our proven 40m- antenna of the last years to a 21m high 2-element-vertical. The construction in combination of wooden tower and glass-fibre-tower is connected only by knots - how it is usual by scouts. Both "Triple-Leg"-antennas are supplied with phase shift by a remote controlled switched adaption-coaxial cable, which influences the QRM discernible. Both antenna parts were mounted to each other in a distance of 1/8-lambda (about 5m). Unfortunally after the first night the wind on the island extremly freshed up, so one of the both glass fibre tower was broken. The repair by a second reserve-tower in the afternoon held out only 5 min. The top of the tower was dammaged again by heavy wind before any QSO (radio contact) was made. In 2007 the 2-element-vertical for the 40m-band was mounted to a total hight of 23m by two 12m long Spiderbeam glass fibre towers. In 2007 and 2008 we made some experiments with a dragon antenna. Unfortunally the dragon could not hold on position to test the antenna. Definitely the next years we will continue this theme. In 2008 we used the mode JT65 for the first time and enlaged the odx on 70cm and 2m to 2x 380.000km! By transmitting via moon (EME = Earth-Moon-Earth) he is used as a reflector. Less than 1% of the HF-power at least returns back to earth. Both systems in combination of two antennas can be switched in vertical or horizontal way. These from Flexa-Yagi-components made antennas never could be sold. They were modificate by Gaby. 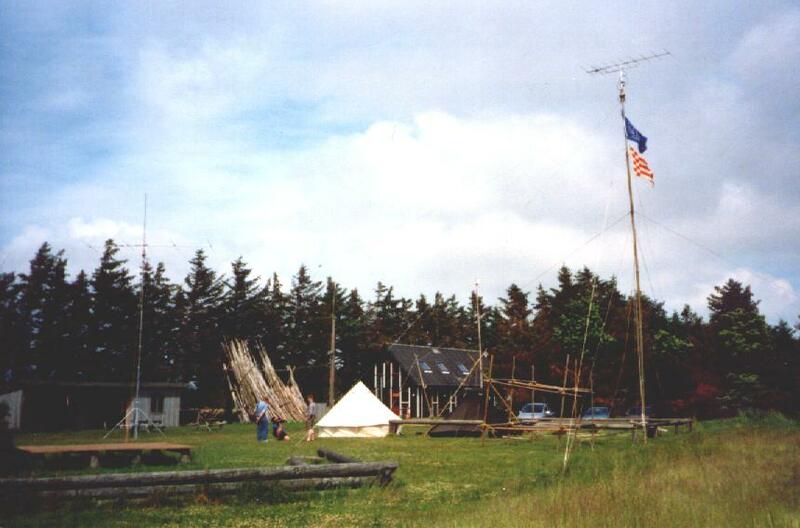 In 2008 another new antenna for the 40m-band was used for the first time: A 4-Square. This antenna is a combination of 4 separate verticals, which will be activated phase shifted. Within a second the anenna-direction can be switched. The gain is the same as a 3-Element- Beam! In comparison to a triple-leg there is a different of more than 20dB! Each vertical needs a network of radials and has to be exactly tuned. Many thanks to Franz, DF6QV, (5A7A-DX- pedition) who gave Gaby a lot of information to this excellent antenna!